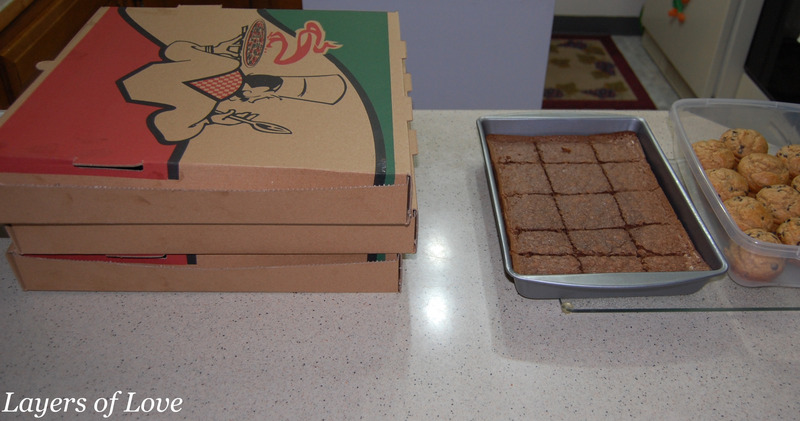 The brownies were baked, the chocolate chip muffins were baked and the pizza’s were delivered. Our first Fleece Tying Family Fun Night was all ready. I had spent the afternoon preparing the blankets. It was very simple to do. Just unroll them, lay them out on the floor and cut the strips all the way around all four sides of the square fleece fabric. My daughter had invited 3 of her best friends over, to help tie the blankets. They enjoyed their pizza party beforehand. When they were ready to begin, I put a movie in the dvd player, spread the first blanket out on the floor, and explained all they had to do, is each one take a side, and begin to tie the strips of fabric together in a simple knot. They were very enthusiastic! They each sat down and began to get to work. I was in the other room preparing more blankets and I could hear the laughter coming from our family room. I wasn’t sure what to expect, but thinking I knew 13-year-old girls I thought they would get bored after 2 or 3 blankets. That wasn’t the case at all. They said it was so easy and they were having so much fun they wanted to do more and more. 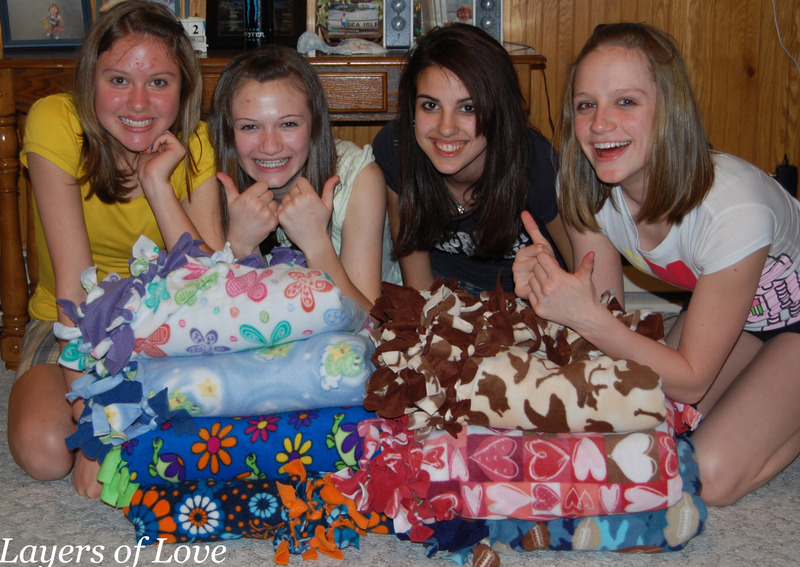 If I would have had 1000 blankets prepared they would have done them all! It took them only 10-15 minutes tops to tie one blanket. They worked together in nice harmony. They got all the blankets tied with plenty of time left for more conversation, laughter and to enjoy the movie. This night was so memorable on so many levels. This night truly made my heart sing. It was so great to see how enthusiastic these young girls were to give of their time on a Friday night, so that a chemotherapy patient (whom they probably will never get to meet) will have comfort and warmth. When I asked about another Fleece Tying Fun Night, they were all on board and simply replied, “just let us know when”. 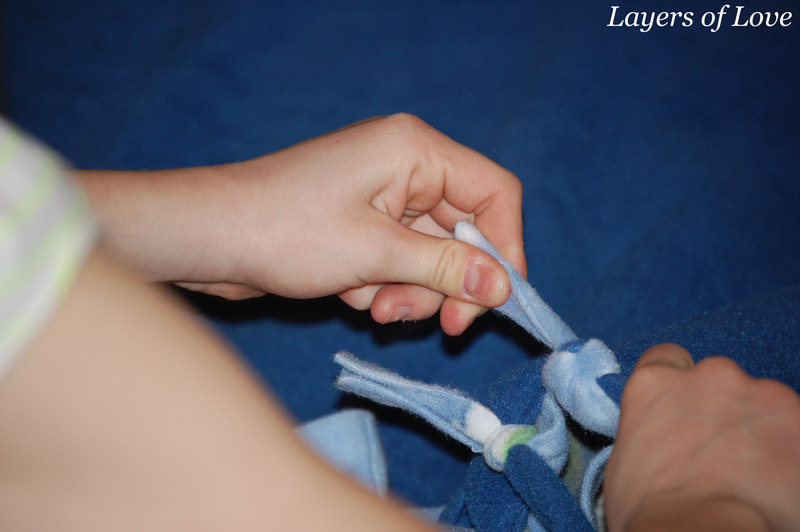 If you would like to have a Fleece Tying Fun Night and aren’t sure how to begin, simply let us know. We will be happy to get you and your group started with some great tips. Feel free to leave a comment below, or you can email us at layersoflove1@gmail.com This is a great volunteer activity for those who are looking for community volunteer hours, great for girl scout troops, teen groups, even adult groups. This entry was posted in Donations, Uncategorized and tagged blankets, cancer, chemotherapy, Donations, fleece, friends, Fun Night, good cause, help, helping, patients. Bookmark the permalink. What you are doing is nothing short of inspiring. You never cease being an example to us all and I am honored to call you my dear, sweet, beautiful friend. What a great time Keira had and for a great cause! Patty – you are inspiring young minds!! awesome!! love that you got the kids involved! keep up the amazing work!